Coin pattern rolls from GarageFlooringInc.com are available in two products, the low cost yet high quality Nitro Roll, and as our premium G-Floor branded Coin Roll. All of our rolls are made of 100% premium grade vinyl to guarantee a garage flooring solution that will last for many years to come. Nitro rolls are currently available in stock sized rolls only and are shipped the same or next business day. Coin Rolls are also shipped factory direct however they usually have a slightly longer lead time. Coin garage rolls are also available in a wider array of colors and can be ordered in custom lengths to help fit any size garage floor. 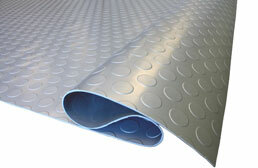 All of our coin garage flooring rolls work well as garage mats or as a complete roll out garage floor covering.